Modern home entertainment devices have evolved in the recent years to electronics with a complicated interface and multiple connectivity. The home theater system, despite it simple but crucial role in the living room can be somewhat tricky to set up. Modern home theater systems have multiple connectivity options and several compatibility interfaces that only complicates the setup process. The problem is, every home theater is designed to fit into any living room seamlessly; and in harmony with all other entertainment devices, such as TVs, computers, VCRs, Tuners, DVD/ Blu-ray players, and even smartphones. All this is great when it comes to compatibility. But it also means you will end up with several unused interface ports, which increase the chance of faulty connections. 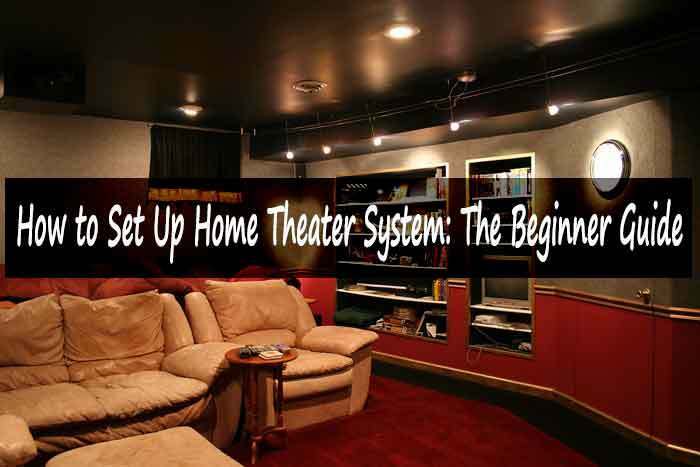 To ease the setup process, first, it is essential to understand the necessary components of a home theater system. And also understand the function of every component before you even begin to set it up. Common home theater systems have a receiver and, depending on their design, either five or six loudspeakers and a medium size sub woofer. Ensure you have all the cables necessary for the installation of the system. Cables offered off-the-box are usually all the cables that you’ll need, so check that they are all there. For a basic setup, there is no need for tools. All you need is a place to set the receiver, near a power source and the audio-input source. Home theaters’ have a speaker configuration of either 5.1 or 7.1 surround. In 5.1, you’ll have two front speakers (left and right), two rear speakers (left and right), a single central speaker (overhead), and one sub woofer. The 7.1 system is similar to the 5.1 system, only that you will have two central speakers instead of one. These speakers are usually marked accordingly to indicate their positions in a room. Generally by abbreviations like FL – to mean Front Left. It is important to position the speakers as indicated to achieve a proper surround experience and sound fidelity. Once you’ve worked out the positioning of the speakers, it’s time to connect them to the receiver. Depending on the model, speaker connections can either have a clip-on or dedicated speaker connectors such as jacks and spade lugs. With the more popular clip-on, a naked wire is inserted into two clips for each speaker. The speaker wires usually have naked and hardened ends, if not, just remove the sheath carefully using a wire stripper or sharp blade. Spade lugs are U-shaped metal clips at the tip of the speaker cable. They are secured by screwing them onto the connector. The speaker connectors are marked to correspond to the specific speaker they should connect to. This is where you need to be careful to ensure that you connect every speaker to the right connector. A connection mismatch in some home theaters may cause damage to the speaker, especially if the mismatch is between one of the loudspeakers and the sub woofer. Now that the speakers are out of the way, lets now set up the input system. How you set up the audio-in interface entirely depends on the source of your audio-input. The input source may be the TV, DVD player, computer or smart device. Depending on your source, you will need to interface it with the compatible connectors. For TVs, you can either connect it to the HDMI or Display Port input or the 3.5mm audio jack. If you’re using a personal computer, it can be interfaced using the 3.5mm jack, HDMI or optical audio-input. The VCRs, DVD and Blu-Ray players interface in the same way, but also with the additional option of the traditional AV connectors. Smart devices such as smartphones, smart TVs and computers can interface wirelessly with the home theater if the option is available. By using Bluetooth or application interface, these devices can easily connect to a compatible home theater wirelessly. Sadly, not every model of home theater supports wireless interface. The audio-in setup can be frustrating. The trick is to follow the audio signal from the source to the home theater. To do this, double check the settings on both the input device and the home theater and synchronize them. It’s important to note that different interfaces will have different audio qualities. Digital inputs such as HDMI, Display Port, and optical audio carry rich, high-quality sound signals with multiple channels that can sufficiently feed to every speaker with real surround. This makes the sound fidelity high and the surround experience more accurate and immersive. Unlike the 3.5mm jack that only carries stereo sound prone to physical interference causing noticeable distortions in the audio-output. Most home theaters come with a DVD/ CD/ Blu-Ray player and an FM tuner. The audio from there features by default fed into the system’s audio-output. This can be redirected and supplied to other auxiliary devices such as TVs or even other speakers or sound systems. Just like the audio-input interfaces, the mode used for connection with auxiliary devices depends on compatibility. There can either be HDMI out, optic audio-out, 3.5 mm audio-out or, AV audio-out. This is the same case with video output. Video can be fed to a TV screen via HDMI video out, Display Port video out or AV video out depending on the available compatibility. Now that the system is set up and powered up, what’s left is to change some user setting and preferences for your experience. Typical parameters include speaker volumes and balance, pitch and other sound adjustments that the home theater can support. The settings are dependent on the model of the home theater. Some have rigid controls, and others have very flexible options. The overall quality of sound experience may very well depend on the audio settings. Setting up a home theater may seem complicated at first when you open up the box full of cables and a dismantled system. But once you get to know what every component does, and where it goes, everything becomes a lot easier.